Dondero High School A Capella Choir, Royal Oak, Michigan. Rick Hartsoe, Choir Director. Coordinated & Released for Comfort Stand by Suzanne Baumann. Special thanks to Rick Hartsoe, Jan Stewart & Ryan Parmenter. For me, it started one Saturday morning in 2002. 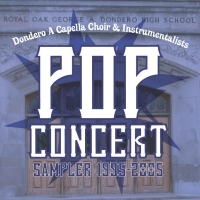 On a whim I picked up two Dondero A Capella Choir cassettes at a thrift store, something to listen to in the car as I went about my errands. I got in the car, popped in a tape and "Black Water" started to play. As with so many ubiquitous pop songs, the Doobie Brothers original never did much for me. It was just another pretty sound that might come over the loudspeakers at the supermarket. The Dondero version, however, pulled the song out of the background and shoved it right in front of me. Now I had context: knowing that high school students learned this song, rehearsed this song, performed it in front of family and friends finally made "Black Water" real to me as a piece of music. This ability to make tired old pop songs fresh is only part of what makes these concerts a such a pleasure to hear, however. There's real skill demonstrated here, and a palpable sense of excitement in this music. The students sound like they're having a great time on stage, and the audience is cheering and shouting with equal -- if not more -- enthusiasm. This holds true through every year of Pop Concert I've heard, and there's eight of 'em sampled here. Listen to the full concerts (Comfort Stand releases 072-079) for the banter between songs and you'll soon understand these kids' genuine fondness for the concert, their fellow choir members, and their instructor, Rick Hartsoe. The students truly put their hearts into each performance. Thanks to everyone involved in these recordings for such hard and amazing work.